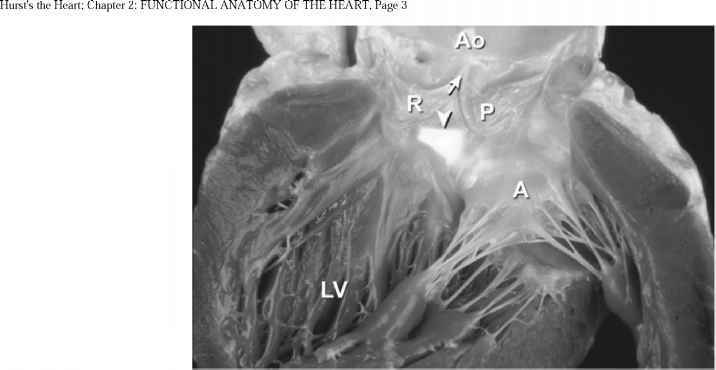 This section in this chapter is an illustrated review of applied cardiac anatomy. The clinical significance of the anatomy described is highlighted in italics. removed, exposing the intrapericardial portions of the superior vena cava (SVC), ascending aorta (Ao), and pulmonary trunk (PT). 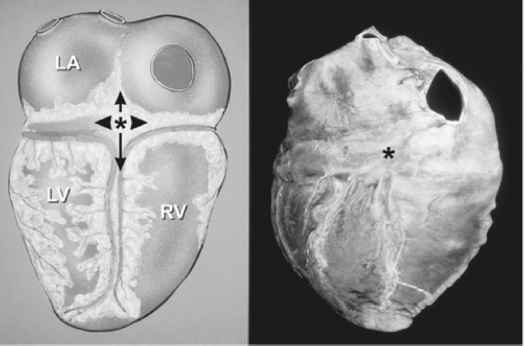 LV, left ventricle; RA, right atrium; RV, right ventricle. The serous pericardium forms the delicate inner lining of the fibrous pericardium as well as the outer lining of the heart and great vessels (visceral pericardium). Over the heart, it is referred to as the epicardium, and it contains the epicardial coronary arteries and veins, autonomic nerves, lymphatics, and a variable amount of adipose tissue. The junctions between the visceral and parietal pericardium lie along the great vessels and form the pericardial reflections. The reflections along the pulmonary veins and vena cavae are continuous and form a posterior midline cul-de-sac known as the oblique sinus. 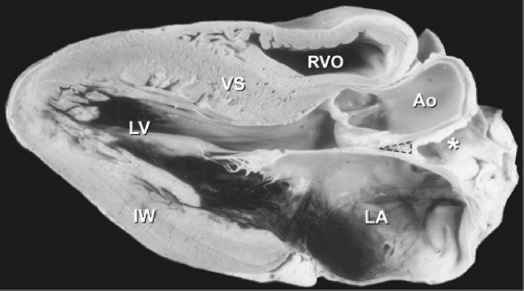 Behind the great arteries, the transverse sinus forms a tunnel-like passageway (Fig. 2-20). After open-heart surgery, localized accumulation of blood within the oblique sinus can produce isolated left atrial tamponade.16 Similarly, a hematoma adjacent to the low-pressure right atrium can cause isolated right atrial tamponade. With increasing age and with obesity, fat can accumulate within the parietal pericardium and epicardium.i6 When imaging the heart, it is important not to misinterpret fat as an abnormal structure or a tumor. Figure 2-20: Tomographic section in the short-axis plane of the body, looking from apex toward the base, showing the oblique (OS) and transverse (TS) pericardial sinuses. Ao, ascending aorta; DAo, descending thoracic aorta; LA, left atrium; LAS, left aortic sinus; LMA, left main coronary artery: PS, pericardial sac; PV, pulmonary valve; RAA, right atrial appendage; SVC, superior vena cava. 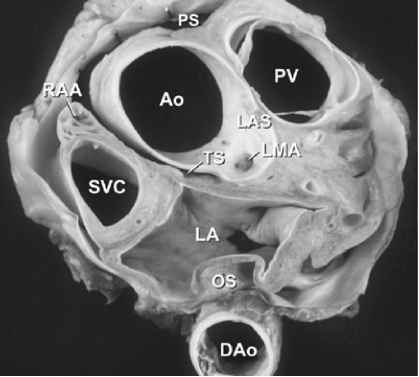 Figure 2-22: Long-axis section of the left ventricle. The intervalvular fibrosa (dashed triangle) lies between the anterior mitral leaflet and the posterior cusp of the aortic valve and abuts the floor of the transverse pericardial sinus (*). Ao, ascending aorta; IW, inferior wall; LA, left atrium; LV, left ventricle; RVO, right ventricular outflow; VS, ventricular septum. Figure 2-33: Long-axis view of the right ventricular outflow (RVO) tract showing the pulmonary valve (PV) and main pulmonary artery (MPA). AoV, aortic valve; LA, left atrium; LCA, left coronary artery; LVO, left ventricular outflow; MV, mitral valve; PulV, pulmonary vein; VS, ventricular septum; *, transverse sinus. 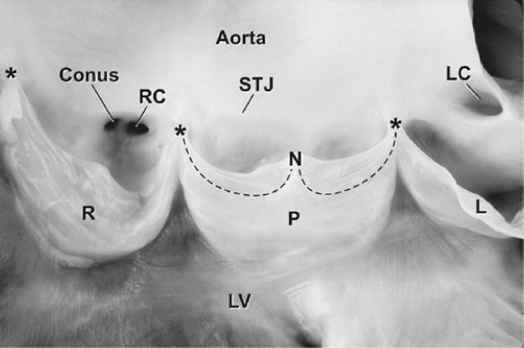 Figure 2-23: This oblique short-axis view of the heart shows the triangular-shaped tricuspid orifice (TV) and the elliptical mitral orifice (MV) at midleaflet level. The anterior tricuspid and anterior mitral leaflets (A) separate the inflow and outflow tracts of the right and left ventricles, respectively, and are parallel to one another. PV, pulmonary valve. The mitral apparatus is comprised of the same five components as the tricuspid valve. Competent mitral valve function is a complex process that requires the proper interaction of all components, as well as adequate left atrial and left ventricular function. Abnormalities ofthe mitral valve apparatus may involve any of these components or combinations thereof. The pattern of pathologic involvement often determines the feasibility of mitral valve repair (surgical or percutaneous).18 The mitral valve annulus forms a complete fibrous ring that is firmly anchored along the circumference of the anterior leaflet by the tough fibrous skeleton of the heart17 (see -H 5 Fig. 2-21). Therefore, dilatation of the mitral valve annulus primarily affects the posterior leaflet. All current operative mitral repair techniques are based on this principle of asymmetric annular dilatation. Mitral valve annuloplasty reduces the mitral valve inlet area by reducing the circumference ofthe posterior leaflet.17 This is the rationale for using a partial posterior annuloplasty ring. The commissures are cleftlike splits in the leaflet tissue that represent the sites of separation of the leaflets (Figs. 2-25 and 0-H0; 2-26A). 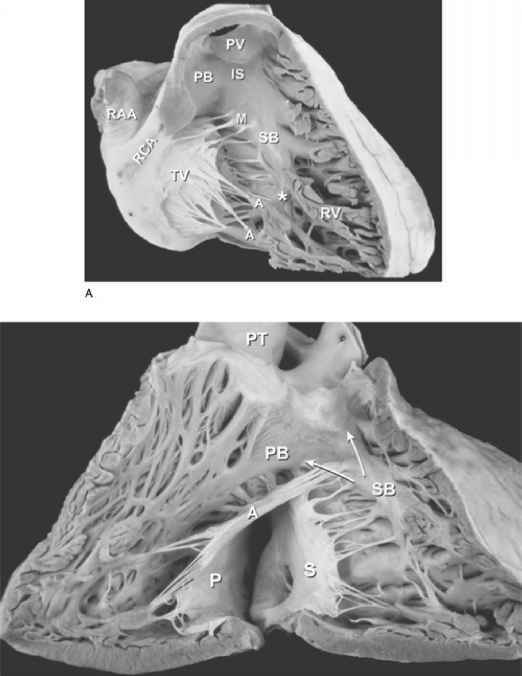 Beneath the two mitral commissures lie the anterolateral and posteromedial papillary muscles, which arise from the left ventricular free wall (see Figs. 2-18.5 and 2-25). Commissural chords arise from each papillary muscle and extend in a fanlike array to insert into the free edge of both leaflets adjacent to the commissures (major commissures)17 (see 0-»i0i Figs. 2-24 and 0+i0i 2-26^4, Plate 10) or into two adjacent scallops of the posterior leaflet (minor commissures) (see 0-H0i Figs. 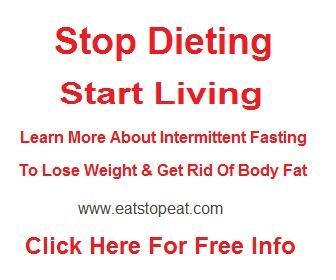 2-24 and 2-25). 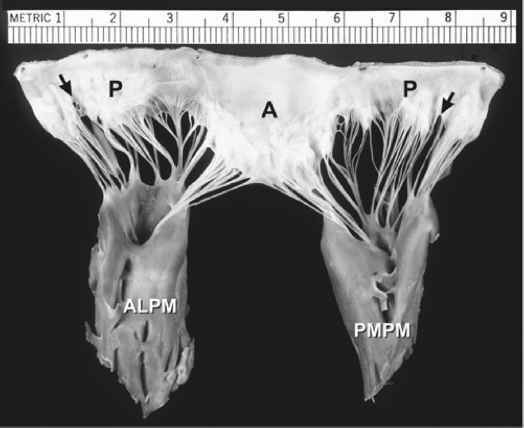 In contrast to congenital clefts, a true commissure is always associated with an underlying papillary muscle and an intervening array of chordae tendineae.17 The attachments of commissural chords precisely demarcate the commissure. Because the commissural chords are seldom elongated, they serve as accurate reference points for determining the proper closing plane for the leaflets during surgical repair. 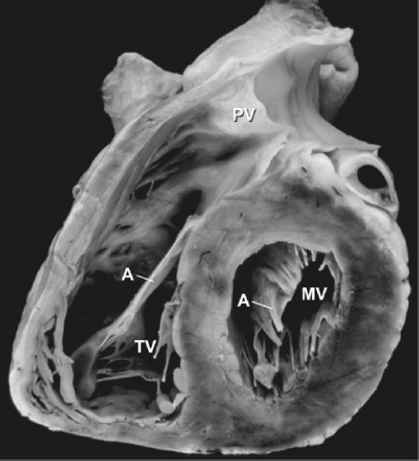 Figure 2-25: Gross anatomy of the mitral valve and papillary muscle-chordal apparatus, as demonstrated in an excised and unfolded valve. Each commissure overlies a papillary muscle. Arrows point to minor commissures. A, anterior leaflet; ALPM, anterolateral papillary muscle; P, posterior leaflet; PMPM, posteromedial papillary muscle. The functional orifice ofthe mitral valve is defined by its narrowest diastolic cross-sectional area. 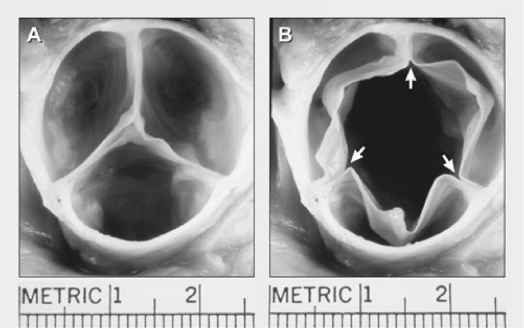 This may be at the annulus when there is extensive annular calcification or close to the papillary muscle tips in patients with rheumatic mitral stenosis. Mitral valve prolapse is characterized by thickened and redundant leaflets, annular dilatation (with or without calcium), and thickened and elongated chordae tendineae (with or without rupture). Prolapse ofthe posterior leaflet occurs more frequently than that ofthe anterior leaflet. Rheumatic involvement ofthe mitral valve causes chordal shortening and thickening without annular dilatation. Rheumatic mitral stenosis is produced by chordal and commissural fusion, often with calcification, whereas rheumatic mitral insufficiency results from scar retraction of leaflets and chords.i5 Chronic postinfarction mitral regurgitation is associated with left ventricular dilatation and scarring of a papillary muscle and its subjacent ventricular free wall. Acute postinfarction mitral regurgitation may be associated with partial or complete rupture of a papillary muscle, usually the posteromedial one. Anatomically important structures during mitral valve surgery include the left circumflex coronary artery, which courses within the left atrioventricular groove near the anterolateral commissure, and the coronary sinus, which courses within the left atrioventricular groove adjacent to the annulus of the posterior mitral leafletH (see Fig. 2-21 A). Figure 2-27: Each cusp of a semilunar valve is pocket-shaped. The aortic valve is viewed from above in simulated closed (A) and open (B) positions, showing the three commissures (arrows). Note that the length of the closing edge exceeds the straight-line distance between the commissures. Figure 2-28: An opened aortic valve shows the right (R), left (L), and posterior (P) cusps. The dashed line marks the closing edge. Between the free and closing edges of each cusp are two lunular areas, representing the surfaces of apposition between adjacent cusps during valve closure. The commissures (*) attain the level of the aortic sinotubular junction (STJ). Conus, conus coronary ostium; LC, left coronary ostium; LV, left ventricle; N, nodule of Arantius; RC, right coronary ostium. Figure 2-29: Aortic cusp fenestrations (arrows) occurring in the lunular regions near the commissures. This is a common age-related degenerative finding and normally accounts for little or no aortic valve regurgitation. A prebypass intraoperative transesophageal long-axis view ofthe left ventricular outflow tract is used to measure the aortic valve annular diameter prior to replacement by a homograft. By doing so, precious bypass time is saved while the homograft is being prepared.8 Disease processes that produce commissural fusion such as rheumatic valvulitis or which decrease cusp mobility such as fibrosis or calcification may lead to aortic stenosis.15 In contrast, those disorders which decrease cusp size such as rheumatic valvulitis or which cause aortic root dilatation may lead to aortic regurgitation.15 Combinations of these processes may produce combined stenosis and regurgitation. Figure 2-30: The commissure between the right and posterior aortic cusps (arrow) overlies the transilluminated membranous septum (arrowhead). A, anterior mitral leaflet; Ao, ascending aorta; LV, left ventricle; P, posterior aortic cusp; R, right aortic cusp. The atrioventricular groove encircles the heart and defines its base. It separates the atria from the ventricles (Fig. 2-31). The two ventricles are separated by the anterior and posterior (inferior) interventricular grooves, which define the plane of the ventricular septum (see Figs. 2-5^4 and 2-31). 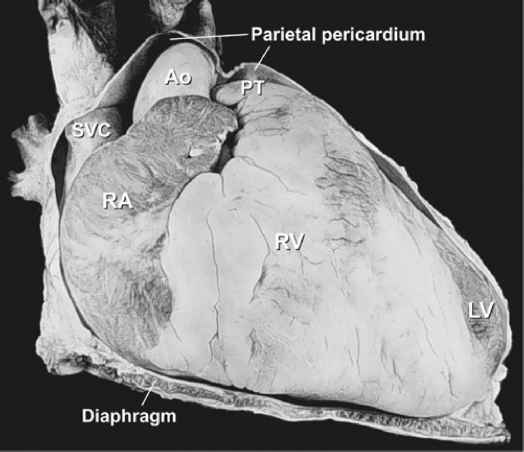 Figure 2-31: View of the diaphragmatic aspect of the heart shows the intersection of the atrioventricular (arrowheads), posterior interventricular (long arrow), and interatrial (small arrow) grooves at the external cardiac crux (*). (Left) Diagram. (Right) Cardiac specimen. LA, left atrium; LV, left ventricle; RV, right ventricle. The right ventricle is a right-anterior structure. It is comprised of an inlet and trabecular and outflow segments15 (Fig. 2-32). The inlet component extends from the tricuspid annulus to the insertions of the papillary muscles. An apical trabecular zone extends inferiorly beyond the attachments of the papillary muscles toward the ventricular apex and about halfway along the anterior wall.15 This muscular meshwork is the site of insertion of transvenous ventricular pacemaker electrodes. During tight ventricular endomyocardial biopsy, tissue generally is obtained from the trabeculated apex. Disruption of a portion ofthe tricuspid support apparatus is a potential complication ofright-sidedheart instrumentation (e.g., right ventricular endomyocardial biopsy).17 The outflow portion, also known as the conus (meaning "cone") or infundibulum (meaning "funnel"), is a smooth-walled muscular subpulmonary channel15,17 (see Fig. 2-32). Figure 2-32: Right ventricle. A. The right ventricular free wall has been removed to show the archlike crista supraventricularis, which consists of the parietal band (PB), infundibular septum (IS), and septal band (SB). The moderator band (*) joins the septal band to the anterior tricuspid papillary muscle (A). The anteroapical portion of the chamber is heavily trabeculated. M, medial tricuspid papillary muscle; PV, pulmonary valve; RAA, right atrial appendage; RCA, right coronary artery; TV, tricuspid valve. B. The right ventricle has been opened by the inflow-outflow method to show the parietal band (PB) separating the tricuspid and pulmonary valves, as well as the two upper limbs (arrows) of e septal band (SB). A, anterior leaflet of the tricuspid valve; P, posterior leaflet of the tricuspid valve; PT, pulmonary trunk; S, septal leaflet of the tricuspid valve; other abbreviations as in A. What is the clinical significance of transverse pericardial sinus? Which pericardial sinus clinically more important? Why is transverse sinus is of surgical importance? 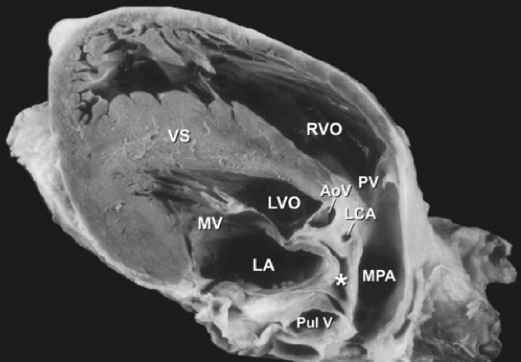 What is the clinical significance of transverse sinus of heart? What is the clinical use of transverse and oblique groove in cardiac? What is the clinical importance of the pericardial sinuses? Why do surgeons use transverse pericardial sinus? What is transverse sinus funtion in heart? Why is surgically importance of coronary vessels are in epicardium? 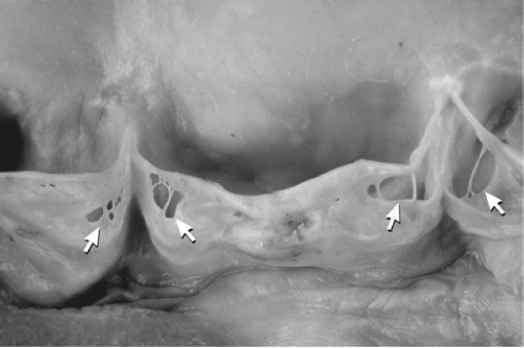 What is the use of transverse sinus of pericardium to surgen ? What is the clinical significance of crux of heart? Why surgeon use transverse sinus? What is use of transverse sinus for cardiac surgeon? Why transverse pericardial sinus is important for cardiac surgeon? Why pericardial sinus is important for surgeons? Why is transverse pericardial important to cardiac surgeons? What will be posterior to transverse coronary sinus? Why and how transverse sinus formed in heart? 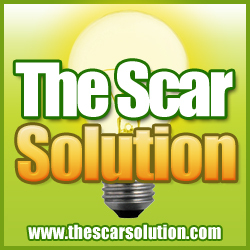 What is the significance of the sinuses of the pericardium? What is surgical significance of transverse pericardial sinus?